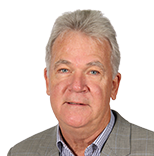 Farm broadcasting has been a constant in the daily lives of farmers and ranchers for more than 75 years and continues to prove its worth in delivering live, local and current agricultural news today. Recent research conducted by the National Association of Farm Broadcasting (NAFB), found 88 percent of farmers in the U.S. listen to farm broadcasting three or more days per week. 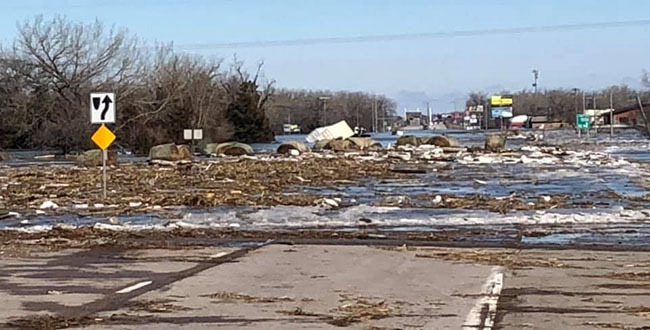 Farm radio continues to connect with the agricultural community daily, providing key knowledge on the day’s biggest ag news. Farming is a 24/7 job. Working from sunup to sundown, farmers rely on multiple forms of communications to keep them informed, and up-to-date with the industry. Farm broadcasting is one of the multiple ways farmers, and ranchers stay connected. Radio continues to be widely used by farmers in all age ranges, as they seek out information that matters to their operation. 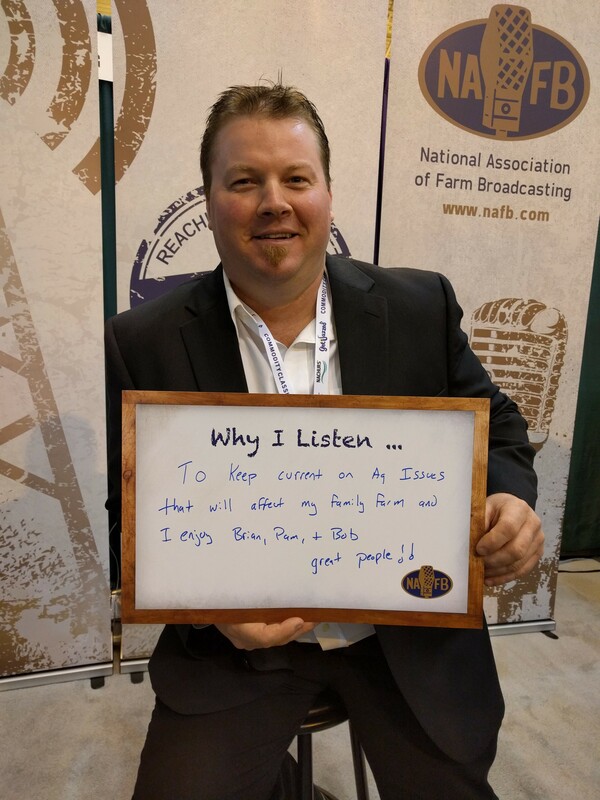 Over the last two years, we have had the opportunity to connect with farm radio listeners and farm TV watchers at several trade shows, and it’s amazing to hear the many reasons they choose to stay connected to the agricultural industry over the airwaves. Radio is an important part of everyone’s lives. Thank you to everyone who stopped by our booth at Commodity Classic 2016. 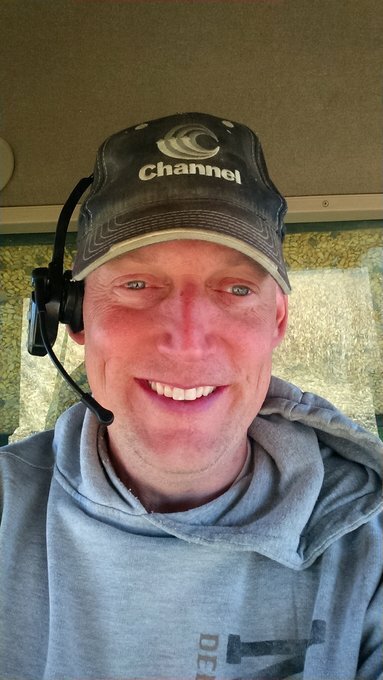 Farm radio connects with today’s technology savvy farmers. We learned a lot of great reasons why farm broadcasting is important for the agricultural industry. A big thank you to all the NCBA attendees who stopped by the NAFB booth and told us why they listen or watch to Farm Broadcasting. Farm Broadcasting keeps these producers connected to the industry, global ag markets, weather, commodities and more. 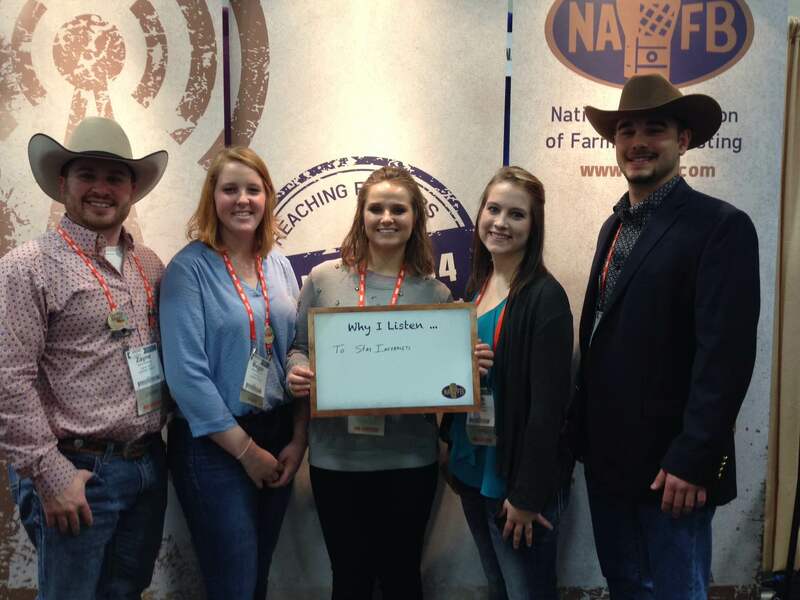 Farm radio listeners range from college students, families, ranchers, and business partners. Thank you for listening. 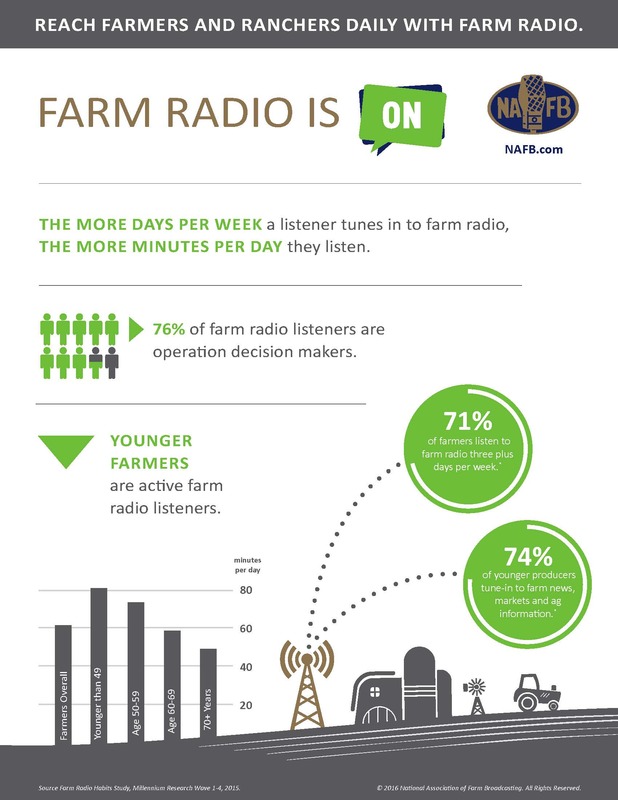 NAFB releases new industry research highlighting farmers and ranchers farm radio usage. Research was conducted in three waves this year, Wave 1 – February/March, Wave 2 – May/June and Wave 3 September/October. Research findings show farm radio listening is consistent among producers throughout all three waves, and the more days per week a farmer listens, the more minutes per day they listen. In addition to the phone call survey, we also recruited respondents to participate in a mobile diary research, provided daily photos of how they listen to farm radio. Farm Radio continues to play an important role in connecting the ag producers and the industry together. Radio is mobile; its on and farmers and ranchers are listening. Recent research conducted by the NAFB studied media habits of farmers and ranchers with $100,000 plus Gross Farm Income. 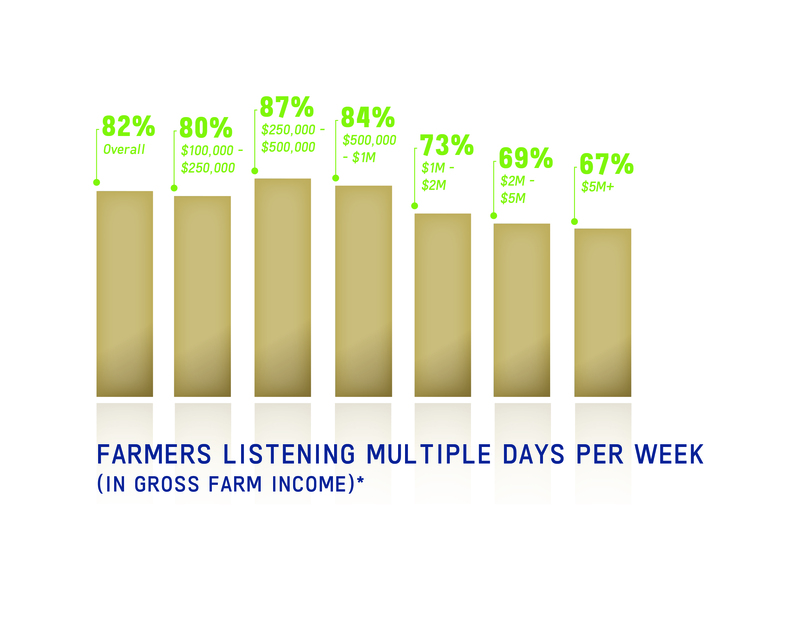 82 percent of all farmers and ranchers are listening to radio multiple days per week. 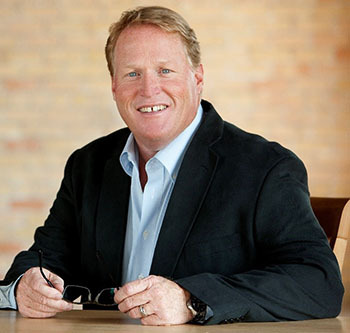 Join NAFB Members For An Informative Panel Discussion On How Media Planning Has Changed In The Last 15+ Years. Farm Radio is an important part of the U.S. agriculture industry. Research conducted by Millennium Research on behalf of NAFB continues to showcase the reach and frequency farmers, and ranchers engage with farm broadcasting. Research focused solely on time spent with farm broadcasting; listening and watching farm news, weather, markets and ag information. Average daily listenership is 65 minutes from Wave 2, conducted this during planting season.